The Freightliner “Inspiration Truck” will be the first autonomous commercial truck to drive on American roads. Nevada Governor Brian Sandoval and Daimler Chairman Wolfgang Bernhard just bolted on its Autonomous Vehicle license plate to prove it’s the real deal, and it’s already been spotted in action. Big rigs might seem a little old-school in an era where everything travels by carrier drone– oh wait, it doesn’t. The American Trucking Associations says trucks moved 68.5 percent of all domestic freight tonnage in 2012 and Bernhard thinks current road freight volumes will triple by 2050. In a Q&A session going on right now, Bernhard has explained that the Inspiration Truck will still have a driver, but that person’s purpose will be solely to monitor the truck’s systems and intervene in the event of a malfunction. The truck requires no special hypothetical infrastructure, and it’s able to read road signs and traffic signals on its own. 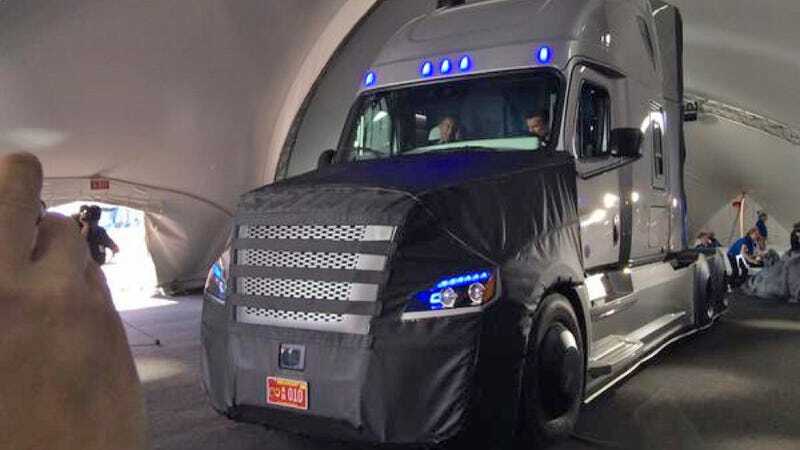 Freightliner has not revealed anything about the truck’s power, efficiency, economics, or a long-term production scheme but the Inspiration Truck will allegedly be revealed in more detail May 5th at 11PM EST and demonstrated on the road the following day. The company’s Twitter page and #inspirationtruck has been blowing up with updates.